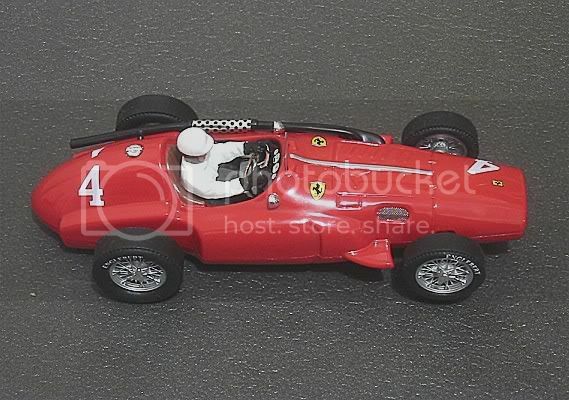 Until recently the Ferrari Super Squalo GP Car was probably absent from the list of models most people would like to own. It was also a name which didn’t spring to mind when talking motor sport classic GP. 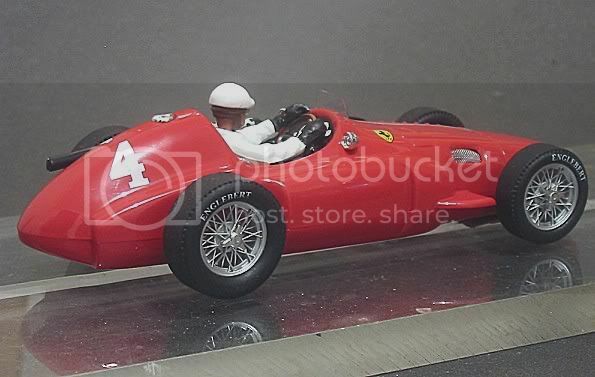 The car itself was probably one of Ferrari’s shortest lived products and only raced under the factory banner for one short season and then with no great success. So what has endeared it to thousands in recent times? Well, I can only theorise, but some things seem quite obvious to me. Firstly, in this day and age of home multimedia, it has become the norm for people to pursue interests into every nook and cranny. Taking hobbies to new levels and in doing so, searching out the lost or unusual items which hitherto have been regarded as ‘non events’ because of their lack of mainstream appeal. Until now, if an average hobbyist had been asked to name the GP cars of the mid fifties, names such as Alfa, Lancia, Maserati, BRM, Mercedes and the like would spring to mind. Ferrari too would be one of the first. Amongst the models that people recall would be 156’s, D50’s, P60’s etc but the 555 would not have been amongst them. Because of the search for the new and lost, the 555 appeals from several points. Firstly it is a hitherto unknown model to the layman. Secondly, for the classic GP lover, it has a definitive shape not mistakable in any colour. And thirdly, it has been blessed with an intriguing nickname “Super Squalo” (Italian for ‘Big shark!). In my view, these things have guaranteed its resurgence (as a slot car model). Highly more appealing than the equally obscure Connaught “Toothpaste Tube” No doubt someone will make that one eventually! The Super Squalos lived on after the ’55 GP season and eventually turned up in events about the globe, some even turning up ‘down under’ where motorsport was as competitive as anywhere and the latest machinery was oft times adapted to dirt circuit racing. The few remaining cars are in private collections and some are bravely wheeled out for classic GP events every year and I for one applaud the owners for allowing these and other superb classic GP racing cars to be raced once again for the delight and education of all generations. Cartrix are fairly new in the slotcar scene and after a tentative start with their early rally cars and a formidable Honda NSX, they are slowly getting into the gist of what international slot cars should be. Spain has a thriving slot car fraternity and as such, local manufacturers can sometimes loose sight of what is required of a truly global model. Spanish slot racing and tracks may well differ in degrees from the expectations of hobbyists in Britain, Germany, US or other countries. None more obvious than the German Carrera releases from the late nineties. The outcry was loud enough for Carrera to revise their model gearing policy for overseas markets. 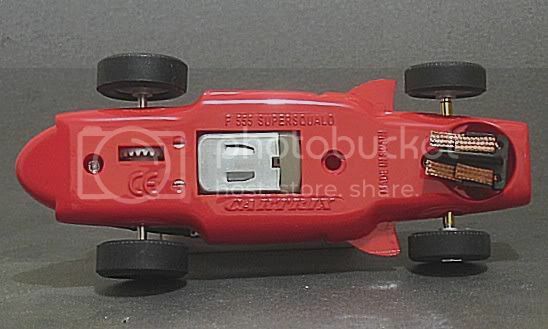 In Cartrix’s case, it appears that Diego and his team are slowly but surely getting together some serious slot car offerings. The ‘GP Legends’ models are made in low volumes in Spain which dictate their price and if the price of a model is to be at the upper limit, then the desirability and model quality have to be paramount. In Cartrix’s case, the first prerequisite is amply fulfilled, With more and more hobbyists becoming collectors, there can be very few more desirable models than the impressive list of future releases that Cartrix have announced! 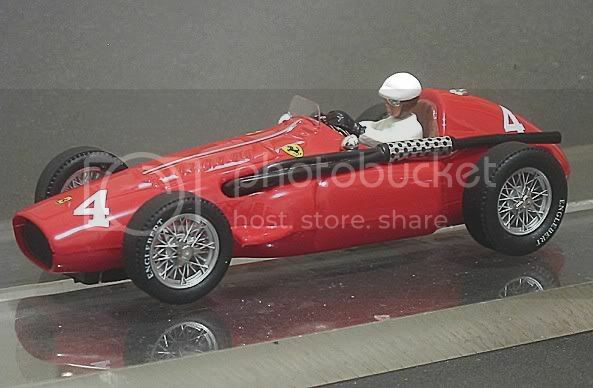 Some of the greatest GP cars from the early F1 years are to be modelled and I for one can’t wait. The second prerequisite is getting better but is still a way off and I urge the Cartrix team to pay more attention to QA procedures! This leads me onto the model I have just bought. I have waited in anticipation for this model and, as I have the Merc 196, I was prepared to expect some quality issues with the model. That said, it hasn’t deterred me and the model is up to my expectations entirely (warts and all!). First impressions are good,……. no…… GREAT! It’s a Super Squalo and it can do no wrong!!!! The model is moulded in red plastic but unlike some other leading manufacturers, Cartrix have given the model a coat of red and a coat of clear to stop that pasty pallor that others have made by clear coating the plastic!! It’s a good red too, I wont get into the argument that it is/isn’t Ferrari red as that in itself is ambiguous and Ferrari would be the first to admit that their ‘RED’ has changed over the years! The model has a nice sheen to it as the original would have had and the minimal tampo / decals? are fine and clear EXCEPT! The number FOUR on the left rear side had obviously ruptured (making me think the markings are decals) on application and wasn’t spotted before the clear coat was applied. The top of the four is out of shape and the gap has been touched in with white paint!! Note, I got this model brand new with its heat shrink wrapper round the metal box intact, which leads me to conclude this repair was conducted at the factory! Diego! My Mercedes 196 has half a ‘Silver Star’ bonnet decal applied and lacquered to the right hand top side of the drivers head restraint fairing, true! The rest of the exterior is fine. The exhaust is finished in black and has an anodised perforated heat shield at the side of the cockpit, which is a very nice touch. Mirrors and filler cap look good too, both, again being chrome and there is a very effective fine gauze mesh in the right side of the bonnet. 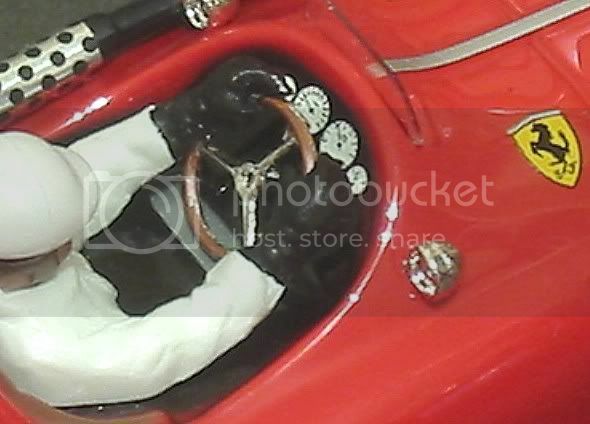 Very nice dash detail and a smartly finished alloy spoked, wood rimmed steering wheel to set off the cockpit detail. The drivers screen is a small clear plastic screen which is IN the roll over range so be aware of this. The driver is finished to represent the traditional white overalls and ‘pudding basin’ helmet common at the time and my only observations would be that apart from the driver being too small, (he looks about 1/40th scale, check out the 1/1 with driver in one of my links) he could of at least had his helmet fettled as there is a prominent moulding seam right across his head! Lastly, the wheels, yes, my favourite feature!! 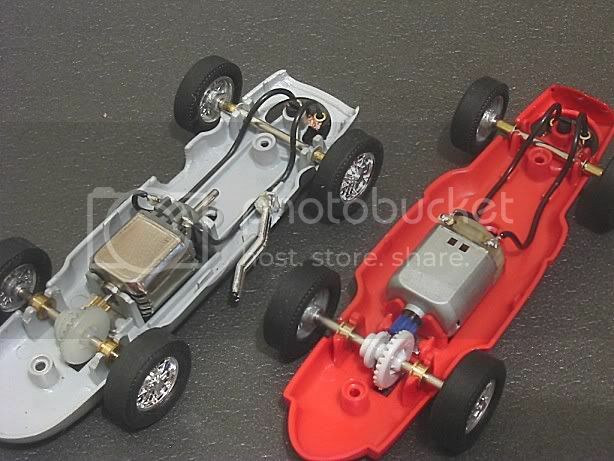 The wheels are the normal spoked wheels we have come to expect from slot car makers and strictly speaking, they are too small a diameter and too wide but because this model has to race on a track I consider it to be an acceptable relaxation of scale. When the model comes to be retired I can trim the axle and fit Ninco classic tyres front and rear to make it look better. 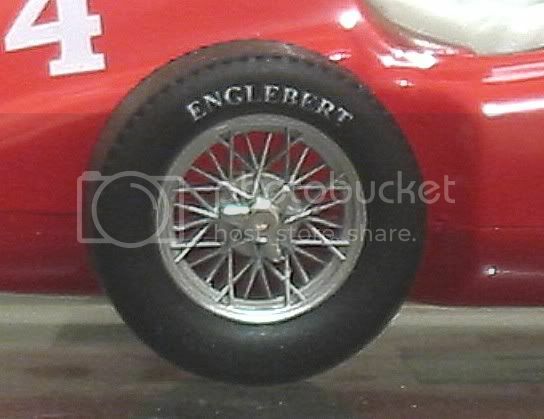 The wheels have been finished with a dull anodising, far, far more effective than the bright chrome offerings we have had to date and the tyres carry the makers name ‘ENGLEBERT’ very neatly printed. The wheels are concentric and the tyres are too, mostly. They have a slight undulation side to side so sanding will be required for hard track work. I would have liked to see some sort of tread impression on the tyres but the tyres are obviously meant for racing. A change to Ninco Classic tyres would set off the ‘shelf queen’ candidates. Looking underneath the model reveals a change in motor from the 196, This is an ‘S’ can of about Scaley standard, approx. 18,000 rpm. The guide has been modified to a twin braid set up which I for one don’t have a problem with. I can honestly say I haven’t felt it to be a disadvantage on any of my models. The guide front to back slop is greater than the Merc 196 and the side to side is a little more too but again it is better than most. Just two screws to hold a well fitting lower body to the upper half and also, as with the Merc, this model is VERY light, which may present some problems on the track! Looking inside, the layout is a standard in line set up. The front axle has a deal of up and down float but is quite restricted side to side. There are a couple of brass collars on the axle which locate against brackets on the chassis half. On this model Cartrix have not included reinforcing gussets on the guide mount hole. Considering the whole model is a fairly thin moulding, I would have expected something here. It is on the Merc 196 !! ?? The motor mounts, too, are fairly thin material and lo and behold, the motor is quite seriously loose in its mounts ‘a la’ Merc 196. This will lead to severe juddering on board track so that’s the first thing to be fixed before track testing Diego! The rear axle runs in a pair of brass bushes but again, the bushes are moving slightly in the mounts. This motor has a plastic 9 tooth pinion but the short motor shaft barely fits into the contrate groove. Not an immediate problem but not good. The contrate has 25 teeth. The traction magnet is a token to adhesion. Measuring barely 10 mm by 5 mm by about 1.5 mm it has a degree of downforce effect but don’t expect it to do much during a head to head on plastic track! I took the model down to my local board track as part of the regular Friday night session with a couple of friends. Again, the track was in use for an hour or so before testing, this allowed the surface to generate a bit more grip and to clear the dust. Putting the model on the track, I Took off at a medium pace. It must be mentioned here that I had already glued the motor in at this stage as it was blatantly obvious it wasn’t going to behave as it was with the motor rocking side to side. Anyway, setting off, the model appeared to be a little sluggish at first but persevering, it soon picked up speed. The back end was very slippery and combined with overgearing, the model had some ironing out to be done. I did several minutes driving at high speed but not pushing it and the car slowly came to life. I can only assume there may have been a motor brush-gear problem as the gears, axles and armature were all running freely. The tyres too were settling in and showing some wear on the high spots. Lap times were 8.9’s and reducing. After a break in the racing I put the model back on and even after a light tyre sanding it was obvious the model was too light for the tyres supplied, or any others for that matter! They felt to be a nice compound so I chose to ballast the model instead of fitting different tyres. The model weighs in at 46 grams, yes, you read it correctly, 46 grams!! Probably creating less work for the traction magnet but a non starter for non magnet racing. Departing from protocol I had to work out some ballast for the model. There wasn’t going to be any significant improvement with a model of 46 grams!!! The top was removed and the available space was measured. The ballast was going to be distributed down each side of the motor and I was looking at at least 15 grams. As it worked out, the weight increase amounted to 15 grams and two narrow strips of lead were hot glued either side of the motor. Back on the track the difference was immediate. The model sparked off the line and corners were under control. So, I decided to press on with a few more laps and let it settle in before I made any more evaluations. Best time on red lane was 8.232 seconds. This was pretty good considering the tyres may still be the weakest link. The model was quite smart out of the corners and its 7mm deep guide flag was more than useful. Deslotting when it came was an oversteer situation with the model spinning in the slot and deslotting backwards. Again, a ballast/tyre situation, but hey! This is a superb shelf queen we’re racing here! As its future is going to be sporadic trips to the track I won’t press any further with handling mods. It’s a great model which drives well with the few concessions I have made and that’s the way I’ll leave it. It has encouraged me to revisit the 196 and update that model too. Front Axle width				48 m.m. Rear Axle width	        			53.5 m.m. As mentioned earlier, Cartrix are fairly new in the hobby and I can see improvements with each new model. If they take note of other manufacturers models and incorporate more and more basic improvements, they have the potential to be a very desirable brand all round. At the moment, I would guess that outside of Spain, they may well be struggling to find a niche. This model and the other ‘Legends’ fills one of those niches, but the rest of their range will need to be more user friendly. Too many times we have seen contrates strip, tyres split or go hard and vital parts work loose and pop out! I waited patiently for this model and I am not disappointed. After fettling it is a great track car and to me a stunner on the shelf but most slot hobbyists don’t have the ability or resources to make these models run well at a time when they should be getting a reason to ‘come back’ . If you are a retro slot nerd or just like a nice model, buy it now! They’re going fast! I got mine from ‘Top Slots ‘n’ Trains.